The compositions docker allows you to save the configurations of your layers being visible and invisible, allowing you to save several configurations of your layers. 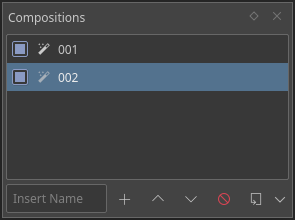 You do this by setting your layers as you wish, then pressing the plus sign. If you had a word in the text-box to the left, this will be the name of your new composition. Double-click the composition name to switch to that composition. The minus sign. Select a composition, and hit this button to remove it. The file sign. Will export all checked compositions. a composition to overwrite it with the current configuration. a composition to rename it.